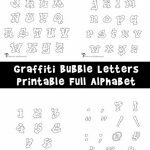 Since printable bubble letters are pretty dang popular around here, I figured I’d better put up some more – and some that I think are pretty dang cute if you ask me! I get a lot of notes from students who use our alphabet letters in school projects and for making posters and signs. If you do anything cool with these letters (embroidery, perhaps?) let me know! Download this letter set as a font here. Looks like fun to draw,I’mma go try it right now! !